A very simple, classic design that calls back to 60s vinyl era. Audio is balanced, clear, and high quality. Automatic tonearm mechanism works very well. The aesthetic is fairly divisive; you’ll either love it or hate it. Pioneer was founded by Nozomu Matsumoto in 1938 as a manufacturer of premium audio equipment, all of it made from his garage. Since then Pioneer has established itself as a mainstay in sectors ranging from GPS navigation to plasma displays. The first impression one gets when you come across the PL-990 is that it looks like a device from a different age entirely. Not just in the sense that, you know, it’s a turntable which is hardly the most up to date, hot off the shelf technology, but the design itself has echoes of the classic turntable aesthetic of the 1960s. The majority of the product is finished in a simple black design, with very little in the way of decorative or otherwise superfluous features. The Pioneer logo, simple and straightforward, is situated towards the left of the front panel, while a row of buttons is also staggered alongside it. This is not the sturdiest player, and is actually fairly small by modern standards, so if you’re planning to take your turntable on the road you may wish for something a little more durable. As you may have gathered from the fairly nondescript appearance, this is a turntable which cares more about performance than it does about looking especially flashy or up to date. As such, the feature list is just as spartan as its aesthetic, and there isn’t a whole lot to discuss. Pioneer has decided to include a feature which we see in many entry level turntables which is the addition of automatic operation. Switching from MP3s to vinyl presents a couple of challenges for a user, none of which is more apparent than the fact that you don’t have to look after digital storage media with nearly as much care as has to be employed when handling records. Ever prone to scratches, and essentially doomed to some kind of wear and tear regardless of how carefully you look after them, the idea to take control of the tonearm’s needle from the user is a welcome addition for many novice vinyl enthusiasts and should prevent scratching. Without many features or customization options to contend with, Pioneer is really backing its ability to produce a great sound from this fairly low cost turntable. On the whole, they have been successful in this regard. The sound quality is markedly better than many of the competing products at this price range, and a lot of that is thanks to the included Phono EQ and pre-amp. The resulting sound is crisp, clean, and versatile enough to produce a solid listening experience across a diverse range of genres and frequencies. The automatic functions do work a treat. The player turns itself on when you press Play, the platter begins to rotate, and the tonearm lowers itself to the start of the record. Once the record has completed, the tonearm lifts itself up, moves to its housing, and the platter ceases to move. It’s all very slick. 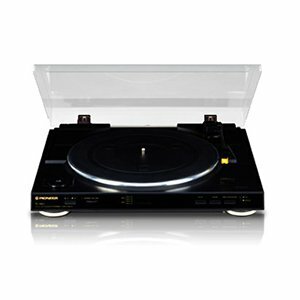 The Pioneer PL-990 is a turntable which will appeal to those who admire the classic aesthetic of the golden age of vinyl. Light on features and visual flair, but packed with quality audio, it’s a good choice for the price.